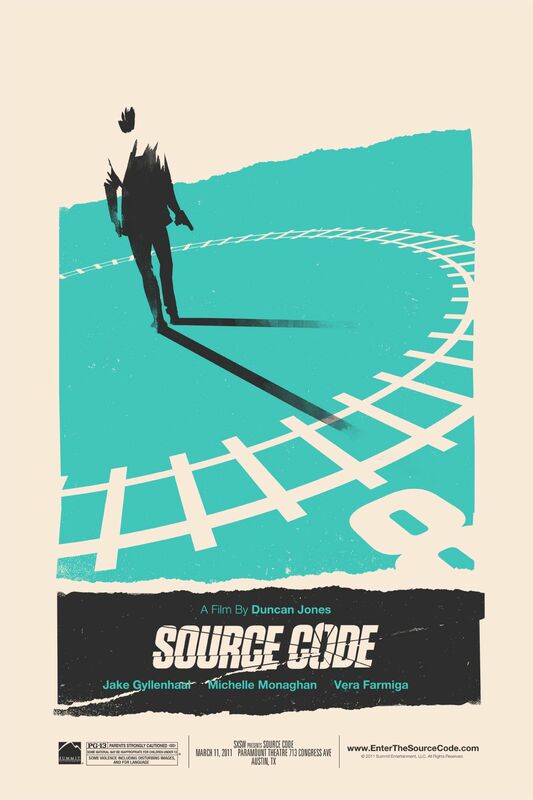 Director Duncan Jones recently did a press tour for his new film Source Code and I was lucky that one of the stops on his tour was Atlanta. With Source Code and his previous film Moon, Jones is quickly emerging as one of Hollywood’s strongest directors for intelligent sci-fi. I, along with several other outlets, sat down with Jones to talk about Source Code, his pet project Mute, another sci-fi project he’s working on that he calls “Like Mute but makable”, and a host of other topics. We also discussed the ending of Source Code and since there are obviously spoilers, I’ve highlighted those portions in red. Hit the jump to check out the interview and click here to see Steve’s video interview with Jones. Also, thanks to Ben Garman for providing the transcription. 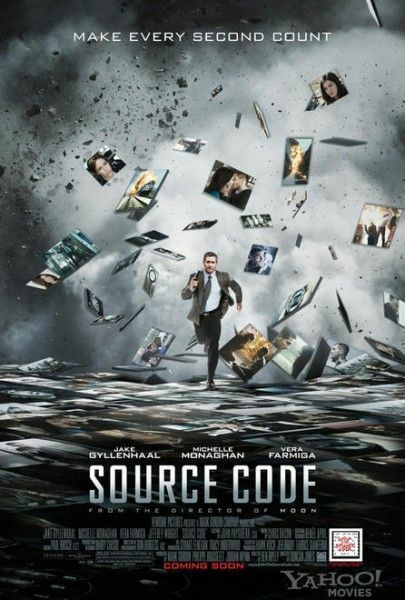 Source Code is in theaters now and you can click here to read my review. I was wondering, was this a project that you came to, or is it something that you sought out or was it brought to you? DUNCAN JONES It was something that Jake actually introduced me to. I was in LA doing some final, final press for Moon internationally. I was kind of traveling around, stopped in LA, had the opportunity to meet with a few people that I really wanted to work with in the future and Jake was one of those people. I tried to convince him to do this film which is never going to happen, and he said, “that sounds great, one day we should do that, but in the meantime…” – and he gave me the Source Code script and said, “maybe this would be good?” So I read it and I thought it was terrific. It was a great start, first ten pages, it starts with a bang. And it just kept on going, and it was really fast paced, and to me it seemed so different to Moon. More than one actor and different locations, and it was so fast paced compared to Moon, so I got a bit excited and I told him what my feelings were about the script; things I loved about it and things I would want to change. And Jake agreed, he said “yeah, I like your interpretation, let’s go do it.” So that’s how it started. When you mentioned things you wanted to change, there are certain themes in Source Code that are also in Moon like replication and dubious authority figures. Was that originally in the script or did you bring that in? JONES: Oh, yeah, I think that side of it, the sort of the structure and the conceit, the set up of the film was always there. I didn’t make any suggestions about changing the script, although I did tweak the ending. But my interest was really in changing the tone of the film because it felt very serious when I read it, it took itself very seriously. It was like an episode of 24 and it was quite grim. And I suggested, I think for this film you’ll actually get more out of it, I think the audience will be able to connect and enjoy it more if it’s lighter, if it’s funnier, if we try and inject some humour in to it. So that was kind of my big spin on it. Can you talk a little bit about the original ending and the tweaks that you made to it? JONES: Sure, it had a very sweet romantic ending originally, which is in the film, but for me it felt there was too many questions left hanging. I mean, without giving away too much, Colter is successful on the mission that he’s been sent on, he’s with the girl, the end. And I was like, yeah, but I’m a sci-fi geek and I’m thinking yeah, but what does that mean? What’s going on here? And so, with the idea… Again, this is all sort of spoiler country, it’s difficult to – well it’s going to be difficult for you guys not for me, I can tell you! Has anybody not seen the movie? JONES: Oh yeah! Has anyone not seen it? Good ok. You know, he completes his mission, he stopped the bomb from going off on the train. He’s in this parallel reality, which is how he’s able to do this and why he’s not locked in to the routine of Sean Fentress’s last eight minutes, so he’s stopped the bomb on the train. He sends a message to Goodwin saying, “look, if I’m right, and I’m now in a parallel reality, then back at your facility there exists a me who has not yet been sent on a mission, so help him, because that life that I’m leading is unliveable.” So that’s really a loose thread that I felt we needed to deal with. And then there’s the other one as to what happened to poor Sean Fentress now that… Well that’s more of an ethical issue and I think that really would come and sour the whole piece if I were to say, and by the way, by making this decision Colter has killed Sean Fentress. But you know, that’s the nature of the script. 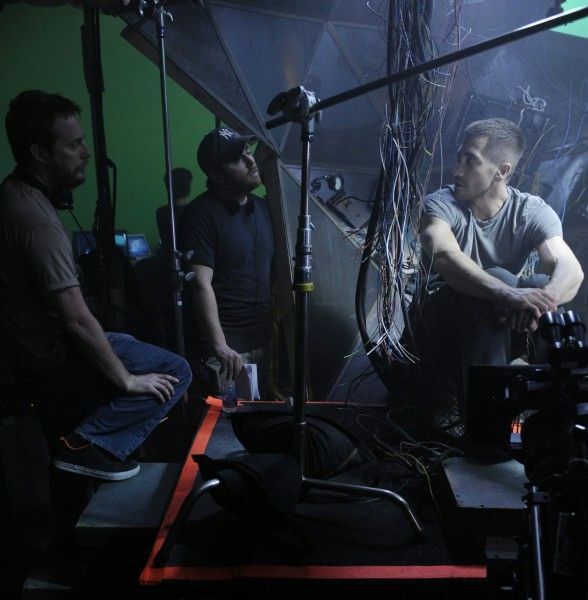 Moon’s a really small film in a lot of ways, and Source Code is the typical big budget Hollywood film, so transitioning from one to the other, did you bring any lessons from your first film, did you learn anything knew working in the studio system? JONES: Well I brought my producer! Which was seriously a massively important thing to do. To come from a small independent film, especially foreign independent film, and to come over to the US and throw yourself in to the mix of Hollywood producers and better known actors, and just be sort of, there, I think I could have easily been pushed around a lot, but I had three people really working in my favour. I brought my producer from Moon and we used to do commercials together and we worked together for a really long time and I knew he had my back. But then I also had Jake on my side, you know, Jake was the one who wanted me to direct the film. So there was a lot of responsibility on his shoulders amongst the producers for me being the director. So I think he felt a real obligation to stick up for me, and it wasn’t difficult because we were in agreement so we kind of had a shared vision about what we wanted to do. And the third person was Paul Hirsh, and I don’t know if you know Paul Hirsh, but he was the editor of the film and he’s a legend in Hollywood. He edited Empire Strikes Back, Ferries Bueller’s Day Off, he won an Oscar for Ray, he did the first Mission: Impossible film, I mean, he really is one of the guys in Hollywood. And for someone that experienced, and who’s that respected in the industry, to say to me literally in the first week, I’m your editor, I’m not the producers editor, I don’t work for Jake, I don’t work for anyone else, I work for you. That was amazing, and to know that I had those three guys looking after me – I was good. How did Paul get involved with the movie, was he already on board when you came in or…? JONES: No. That was one of the first crew call things that we did, is to work out who our heads of department were going to be. So we got Don Burgess cinematographer, and I got to choose my cinematographer, I got to choose my editor, I interviewed a number of different people and Don was the guy I chose and Paul was the guy I chose. – when asked at the Q & A you said that you wanted to explore other genres, what other genres in particular interest you? JONES: I was massively jealous but also excited when Tarantino did Inglourious Basterds, I’m a huge guys on a mission fan. Those kind of movies. Dirty Dozen, Where Eagles Dare, Bridge Too Far, especially those World War II ones, I used to love them. So by the time I’m ready to make one of those films I think Inglourious Basterds will have been long enough ago that maybe people will be ready for another film like that, I’d love to do something like that. 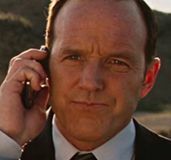 JONES: Yeah, I’m writing a science fiction film right now and unfortunately, as much as I’m enthusiastic about talking about it, I can’t really say much more than that. But it’s going to be, I think, as different as Source Code is from Moon. It’s still science fiction but it’s going to be a whole different, third part of the triangle. Is there also going to be a city based sci-fi, so like Mute? JONES: Well…like Mute, but makable. Well you’ve mentioned making it in to a graphic novel and I was wondering, are there any artists that you’re thinking that you’d like to work with making it? JONES: There are. Yeah, I mean, that’s really something that we just started digging in to, and talking to some of the comics companies, and finding out – literally I’ve never done one before so I don’t know how the process works. I know the artists I like, I like Glenn Fabry and there’s another guy, so it’s really working out… I have a whole education ahead of me as to how those things are put together, how much they cost, and whether it’s doable the way I would like to do it. So we’ll see, but there’s lots of people I’d like to work with it. What format is Mute in right now, is it a screenplay? JONES: Yes. It’s a screenplay that has been worked on for a long time! JONES: Yeah. I wrote it with a guy called Mike Johnson, Mike and I went to film school together a long time ago. Somebody told me the other day how long ago it was and it made me want to cry! Mike wrote the first draft of the Sherlock Holmes film that Guy Ritchie did, and then he also wrote one of the early drafts of the Three Musketeers films that Warner Bros is doing. So he’s young and talented but not probably that well known yet, because they always bring in more established writers to come in and write on top of him. But he wrote Mute with me. Getting back to Source Code, I was wondering, when you read the script did you start thinking through like, ok, I have to keep repeating these sequences, and what were the challenges in having to keep going through these motions to re-establish the train. JONES: Exactly what you said. That was the big fear, I read the script and I was like, this is great, it really works, it’s exciting…how do I make sure the audience is as excited visually as the read is? Sometimes there’s a disjoint between what works on the page and what works with visual story telling. So that became my main objective was to come up with a graph, literally, a system by which each of the repetitions would be visually different but there was narratively something different going on each time, new character interactions. So although this is the same eight minutes, essentially you’re seeing completely different things each time and that was really what I had to do. Why did you guys decide on eight minutes? Why not five or ten, was there any specific reason behind it? JONES: I think when I came to the script it was already eight minutes. I know they had tried different variations on it. 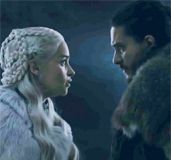 The argument that I heard was that if you go any longer than that, well, first of all it becomes difficult to maintain the real tension and the speed of the script and if you go any shorter it becomes difficult to really get anything done within that time period that allows you to build up a plot. So eight minutes must have been what they worked out as the most effective amount. When it comes to the actual film, you know, you have poetic license when you’re editing. I think maybe one of those sections gets close to eight minutes, but most of them are either shorter or longer, depending on what the event is. I noticed you used the Chesney Hawkes song in both Moon and Source Code, is there any reason for that? JONES: Well it wasn’t really a joke in Moon, but I just love that song. In particular for British people it was kind of a one hit wonder. And everyone sort of remembers that song when they were growing up so it was really effective on that level, and especially for what the lyrics are in Moon. And then it occurred to me that it was kind of a catchy song anyway, and it might be an opportunity to me to sort of, have a little signature in movies, so I slipped it in to Source Code, much to my producers annoyance. They said, well, ok, and it didn’t cost them that much and they were like, “ok, if you want it”, and no-one seemed to mind. Now that I’ve done it twice I have to do it from now on. So I have to find ways in the future to slip it in! I know what I’m going to do in the third film. If you make a World War II one?! JONES: [laughs] It get’s more difficult, I’m going to have to do like, the German version on accordion or something like that! I haven’t worked that one out yet! I know that earlier at one point, Clint Mansell was going to do the music for the film but he wasn’t able to, I think because of scheduling, but one of the things I noticed is it sort of has, almost a Hitchcock, Bernard Hermann kind of score, was that always the intent? JONES: Well, obviously when Clint was doing it that would not have been the intent. You go through different stages when you’re working on the music in film. At least, I do. 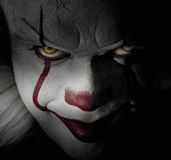 You have a temp score, so you have music from other people, usually from other movies, to give you a sense of what the mood is supposed to be, what the atmosphere is. We had a pretty strong temp and some of it worked because it was of that nature, it had kind of a Hitchcock vibe to it. What Clint would have done I have no idea, I’m sure it would have been fantastic and off the wall and would have completely changed the tone of the movie. But the problem we had is that there was a window of opportunity to shoot with Jake. He had just finished Prince of Persia, he was going to go off and do a world wide Bruckheimer tour for Prince of Persia and we had to shoot within that window and there was no moving it around. And I respect Clint enough that I wasn’t going to push him to try and squeeze out a score when he knew that he didn’t have enough time to do it. And you know, I know Clint well enough to know that. So we said, ok, it’s not going to work this time, we’ll work together in the future. And I hope he’ll be coming to work with me on the next film, we’ll try and make that work. So we were trying to work out what to do next and Paul Hirsch the legendary editor suggested this guy Chris Bacon – middle initial P, crispy bacon! Real name! – and Chris came in I think it was a day after his wife had given birth and he looked like a zombie. He was absolutely exhausted, and we said, we would love to hear what you could do with our film, and we played him the film with the temp score in it and he kind of got where we were going. We talked a little bit about the Hitchcock influences that we had tried to invest in to the film on a visual level and he got it from both that and from the temp score. And four days later, with a wife, with a day old baby, he came back with this piece of music which was the opening credits music. And it’s hardly changed from that first thing that he delivered. So he was our guy. Do you think with movies like Source Code and Inception that we’re going to be seeing more brainy type sci-fi movies coming out of Hollywood as compared to the big robot style movies? I know you talked last night about creating worlds in a sci-fi film and being immersed in a world but here you have to keep repeating the same characters and situations in eight minutes, and so like, with Christina we never really learn anything new about her but we still have to build a relationship with her, what was it like approaching a story where you have to connect an audience to a world that they re-enter every eight minutes? JONES: Well the most essential thing for that particular relationship was getting the casting right and that would have just dropped dead if there was no obvious chemistry between Jake and Michelle, and I think that was the first thing we had to get right. I’d seen Michelle Monaghan in Kiss Kiss, Bang Bang and the fact that she managed to keep up with Robert Downey Jr. was enough reason for me to want to have her come in and see how it worked out, and fortunately she’s very smart and obviously very talented, but the most important thing is that she’s very brave, you know, she’s willing to go with her instincts and then if I make a suggestion she’ll try it. And I find if I make a crazy suggestion that might not make sense, she’ll still try it, and both her and Jake were willing to take that kind of direction. And on this film I think it was really important. The great thing was we had a week of rehearsal time before we started shooting so all the mechanics, all the structural stuff; the key lesson that needed to be learned in each scene, we already had that down by the time we actually started shooting, which meant that when we did start shooting, Jake and her could be very improvisational, already knowing where the A was and where the B was, where they needed to get to. What were some of those crazy suggestions that you made? JONES: Well the tone, I mean, obviously Jake and I had already decided that we wanted to lighten this up and inject some humour in to it, but humour is a very subjective thing and it was finding a performance for Jake that allowed him to really, you know, have fun with that. We talked early on about what kind of leading man was most appealing, what could really work in this. And the fact that you have the everyman hero from the old Hitchcock movies, but we were also thinking about Harrison Ford in the Indiana Jones movies, and how he’s kind of an everyman rough, gruff guy, but he’s frustrated with everything around him, you know, it’s like everything just annoys him. And I liked that. We talked about that, and how that could be an interesting way for Jake to approach Colter Stevens. So I think he took some ideas from that and that sort of, made the performance, which I feel is a great performance by Jake, I think it really shows him in the best light as far as what he can be as a leading man. Going back to the eight minutes thing, so you’re re-experiencing the same eight minutes and since he knows that, at least in all the initial ones, the ending doesn’t really matter so he’s got to kind of, you know, he knows it’s the last eight minutes of his life so he can go and beat up the guys and it doesn’t really matter to him, but with that final permutation where he doesn’t really know what’s going to happen, what were some of the difficulties of going in to that final one, where he’s got to kind of get it right this one time, he doesn’t get another chance? JONES: The final one is kind of the easiest one because by that time he really knows what he needs to do and the question just becomes, well, in his mind, in Colter’s mind, he’s going to get everything right, he’s going to save all the passengers on this train and then he’s going to die, and that’s going to be the end of things. So for him it’s very clear what his goal is. He’s going to save those people on the train and make that ultimate soldier sacrifice. Obviously things don’t turn out that way because the nature of the Source Code [laughs] is that he’s now in this parallel reality which actually allows him to go on living having killed Sean Fentress, and live out his life in the body of a school teacher who obviously has a relationship with Michelle Monaghan or Christina. [pause] That stumped you didn’t it! You mentioned last night about using the virtual stunt men for the scene and how you were kind of inspired by Grand Theft Auto for the role. Can you talk a little bit about that and was that scene initially in there or was that something that you decided to put in there? JONES: The scene was in there and it was really really mundane. You know, he pulls the emergency chord, the train comes to a stop and he gets off. Dramatically it’s difficult to make anything of that, so you know, we put a little goose on it and it was so much fun for me because there were a few opportunities in the film where I really had the opportunity to play with the big boys, get some big toys in there and do some fun stuff. Because it was a middle budget thing, like Moon, we had to choose those moments. We couldn’t just do the whole film whole sale like that. 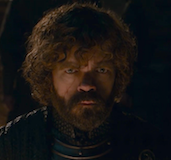 That was the moment where I thought this is an opportunity to really have some fun, make a little homage I guess to computer games, because the film does by it’s very nature have that idea of you know, playing a character and having them constantly die until you get the mission right. And I wanted to do that shot. No-one’s ever done that shot before. I think it’s probably my generation and guys who are younger who are starting to see computer games as being a completely valid cultural reference, where you can draw inspiration. I mean, Edgar Wright draws, obviously in a much bigger way did it for Scott Pilgrim, all over the place did these amazing really funny references – if you’re a gamer! If you’re a gamer! But you know, I wanted to do one here and I thought it was appropriate. Having said that, what are your thoughts on Roger Ebert’s criticism of video games as art? JONES: [laughs] I’ve read that. I think it is a generational thing. I don’t mean to sound mean, but I think I was brought up with games and I don’t think that they’re just Pac-Man or Space Invaders. I think we’ve moved on, I think that there are stories being told and worlds being explored. I don’t know if he’s ever played Assassin’s Creed, but it’s probably not what he thinks of when he thinks of computer games. As a film maker, last night you said you were inspired a lot by Blade Runner. What other films and film makers in general do you look up to? JONES: Generally, visual guys, generally the people who are story tellers but who also have that handle on the visuals. I was a big fan of Luc Besson and obviously Ridley Scott. Terry Gilliam, he’s a really interesting and amazing film maker, and when he gets it right it’s really powerful stuff. David Fincher these days. Yeah, Fincher I think is fantastic, I loved The Social Network, and obviously Fight Club, and Se7en. He makes amazing films. So those kind of people, and Kurosawa back in the old days. Would you say, this is going back to Moon, Stanley Kubrick 2001? Because I noticed a lot of things that were similar, not the same, they just seemed like they were paying respects to the film. JONES: Yeah, Kubrick is one of those guys. When I was a kid and I was being introduced to science fiction by watching movies with my Dad, Kubrick is one of those guys that we used to watch, you know, I watched Clockwork Orange at an age that was incredibly inappropriate, but he sat there with me and he explained what was going on and you know, I came to appreciate it even if I was terrified at the time. And then 2001 of course, which is just this amazing piece of hard sci-fi that really gives you a sense of what the future could be, and the fact that he did it such a long time ago. I mean, there’s an amazing documentary about Kubrick, I think it’s called Kubrick’s Boxes or something, that’s all about all of the vast vast library of information that he sort of ferreted away over the course of his life in these shoe boxes that existed in a small house, you know, a small property outside of his house. And there was just this huge mountain of them and they haven’t even been all gone through, and each one of them was for possible ideas for films and things. He’s just such a stickler for information and for detail and for understanding, what he’s going to do and how he’s going to tell his stories, you can’t help but admire that. Even if not all of us have the time to work that way! Do you think that because with the success of Moon, and even if you go back to 2001, that there still is an audience out there willing to look at hard sci-fi or do you think that with the bigger and the bigger that you want to make it, the more accessible it has to become? JONES: I would have to go back to Inception. I think if you have the right combination of director and actors who are able to draw in the audience, you should be able to find a way to do it. But I do think that you have to be realistic. You are spending millions and millions of dollars of other peoples money when you make a movie. You have to at least approach it in a way where you can see how you can make that money back for the people who are investing. It’s not a game, you know? It’s not just for fun. Somebody else’s money is in your hands. You have a responsibility to try and deliver something that people want to come and see. Hopefully there is an audience out there for the thing that you are making but you know, you have to approach it like a grown up. I don’t want that to sound like a killjoy, I think that you can make amazing films with that mindset. I mean, Fincher is a great example. He approaches really unusual projects and he does them in a visually stunning way and gets great performances out of people and people want to go and see his films. But he wants to make money for the people who invest money in his films. He’s not just doing it because you know, that’d be a great idea, that’d be fun. He’s approaching it in the right way. I know you said you can’t say much but this upcoming sci-fi film of yours, where does it fall on the hard to soft sci-fi scale? JONES: I would say hard but with a really good dose of action. It’s a future city film but it’s a globe trotter. You’re going to get to see a lot of cities in the future. I’m really excited about it. In both Moon and Source Code, I noticed there was a clear isolation of the protagonist. Is that a theme that you are going to continue to explore or is that just a coincidence? JONES: I think it’s a bit of a coincidence. The thing that appealed to me about the Source Code script was the differences not the similarities. [His phone goes off] Actually I’m just going to have a look at this, it might be funny. Yeah it is, it’s Jake. “How goes it dude?” [laughs] It was the differences that really appealed to me. 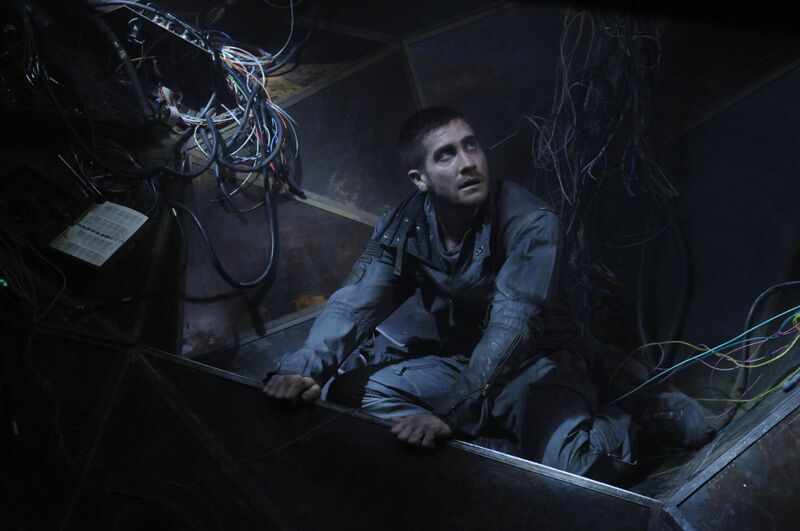 The scope of it, the pace of it, the opportunity to work with Jake, on a subconscious level I’m sure that part of what made me say yes was the recognition that there was something there which I found interesting on a different level, the idea of identity and you know, I think there was definitely something there, but it wasn’t a conscious choice. What was the reaction, you know, when you showed it at South By Southwest, that was the first time in front of an audience? JONES: Yeah, yeah, that was it – the first one! Nerve-racking! JONES: I couldn’t bring myself to sit there and watch it in the cinema, I was too nervous so my lovely girlfriend Rodene and I went to have a meal next door and just tried to forget the movie was on. And then about ten minutes before the end we went back and we sat and kind of, looked over peoples shoulders and there were some good laughs at the right moments, there was a good reaction it felt, it felt like the appropriate reaction, and then lovely applause at the end, and you could tell that people seemed to enjoy it, so it was a good feeling. It was nerve racking because obviously there is this concern, this fear. The first film, when I went there with Moon two years ago, no-one has any idea what you’re bringing and there’s no expectations, and obviously there was a lot of people in the crowd who had seen Moon and there were some real expectations, and specifically for the people who loved Moon, I didn’t want to disappoint them or, even though in my opinion the film was so different from Moon, I didn’t want them to feel like I’d let them down or gone off and sold my soul or something. I tried to deliver something different but something that I cared just as much about. We’ve talked about references a lot, and the references you had to other sci-fi films and to video games, do you feel like you’re a film maker who builds references in to your style? How would you define your approach to film making? JONES: I don’t know. I guess I’m kind of eclectic you know, I have different tastes and I think hopefully, if I get to make a third or a fourth film I’ll be able to explore other things, and over the course of… I’m not coming in there with one style. I’m not the guy who does slo-mo, or I’m not the guy who does splashing rain, or doves flying or anything, that’s not me. Every film I try and make it the way I see it in my head, and it really just depends on the script and the people I’m working with or whatever interests me at that particular time. So if I have a career, and hopefully I will, hopefully over the extent of it, you’ll be able to see whatever it is that I tend to do, which I don’t know yet, I’m kind of learning it as I go along. You mentioned that your new film was going to be in a futuristic city and stuff, what is your opinion on CGI effects because sci-fi is going to be pretty CGI heavy you would imagine? JONES: Yeah, I mean, Moon wasn’t, but that was just the nature of that project. But I really believe that you use the effects specifically for the problem you try and solve. It’s not about, “I want to use this particular effect”, you should use effects on the whole, unless you’re jumping off a train, you choose an effect to solve a problem. And Post Houses are becoming so good and not just the big ones, we used a lot of boutique special effects houses on Source Code, so we kind of spread the load over smaller places, and they’re becoming incredibly adept at doing not just spectacular things, but also very subtle things. Things like putting a landscape moving in a window. That sounds like it’s easy, but to get it right that takes time, and that takes a maturity in that industry. So I don’t have any kind of problem with using CG, it just has to be the right tool for the job. And no-one would ask Neill Blomkamp when he did District 9, “oh, you shouldn’t have used CG”, it’s amazing, it works! And then in that case he used it just right. One thing that I found very refreshing in this film was the fact that the romance between the leads, Jake and Michelle, wasn’t like, the key factor in the story. Was that your choice or was it the key factor in the script and you changed it or…? JONES: No, again, that was always part of the script. The only tweak I made is as opposed to ending on that I felt it was really important to follow up on this loose end. But that was there, and I think the level of it and how it kind of weaved in with all of the other stuff that was going on, that was in the script, and I think it was really well done. When you say, “ending on that” did the movie end on that freeze frame? JONES: No, it was actually on the bean, the big sculpture outside of Chicago. They tried that out and I sat there sulking! So the freeze frame doesn’t really happen, they just kind of play it out and then walk off? JONES: Oh what? You mean in the script? Oh, in the script it didn’t exist at all. In the script there was no freeze frame, there wasn’t even a bean, it was just, it was quite, in that respect, visually that was my interpretation. Originally it was based in New York the script. And in a very, you know, obvious sexual metaphor, the train would disappear in to a tunnel at the end of each sequence. Well, at the very end of the film it disappeared in to a tunnel, and I didn’t think that was necessarily the way I wanted to go with it. And we ended up moving the story to Chicago, and I was a big fan of the Anish Kapoor sculpture which is that big reflective kidney bean in Chicago. And I thought for me, that was not only useful as a visual but also we have this series of nightmarish flashbacks that he has each time he gets sent back, and it was great because you could actually use close ups of that as your visual and have no idea what it was you were looking at, it was almost like this weird kaleidoscopic effect, and then over the course of the film you get further and further back and you reveal more and more and then there’s this thing that still looks really alien and weird, but it’s an actual physical thing in a real place, and that’s where we go to at the end of the film. And now you’re director of Moon and you’ve made a Jake Gyllenhaal thriller so are you comfortable now and have you transitioned in to the studio system and you’re making these movies or do you want to keep changing and bucking the label? JONES: I really don’t know, in all honesty, I don’t really think of it that way. I made Moon because I wanted to make feature films and this was the best way that I could bring all of the skills and the favours and the friends I had together and make something, and just make a film. And that’s always I think the hardest step, is to get a film made. Source Code was the opportunity to work with some big name actors, do work with Jake, who I was a big fan of, work in the Hollywood system with some more money and more toys to play with. The next film I’d like to do would be something I’ve written myself with the same kind of money that I did Source Code on, and hopefully we’ll take it from there and see how that goes down.